Registry Flashlight Fixer is a simple and easy to use registry booster which enables you to control the most hidden Microsoft Windows operation system settings to suit your special needs for security and safety. 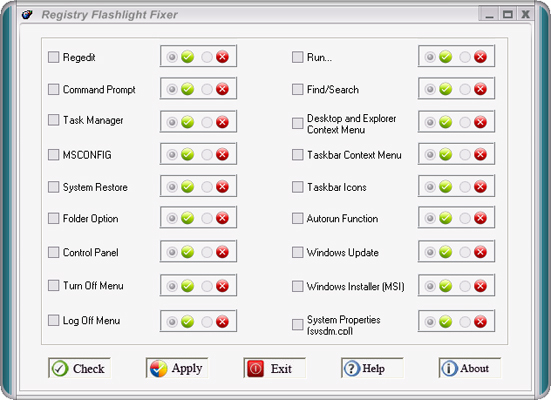 Registry Flashlight Fixer comes with 18 options for registry optimization: Regedit, Command Prompt, Task Manager, MsConfig, System Restore, FolderOption, Control Panel, Turn Off Menu, Log Off Menu, Run, Find/Search, and others. ...... Prompt, Task Manager, MsConfig, System Restore, Folder Option, Control Panel, Turn Off Menu, Log Off Menu, Run, Find/Search, Desktop and Explorer Context Menu, Taskbar Context Menu, Taskbar Icons, Autorun Function, Windows Update, Windows Installer, System Properties. Registry Fox gives your PC instant relief from errors and slow performance! Qweas is providing links to Registry Flashlight Fixer 2.9.0 as a courtesy, and makes no representations regarding Registry Flashlight Fixer or any other applications or any information related thereto. Any questions, complaints or claims regarding this application Registry Flashlight Fixer 2.9.0 must be directed to the appropriate software vendor. You may click the publisher link of Registry Flashlight Fixer on the top of this page to get more details about the vendor.